Nike Trail Running exhibited at Outdoor Retailer for the first time that I can recall. 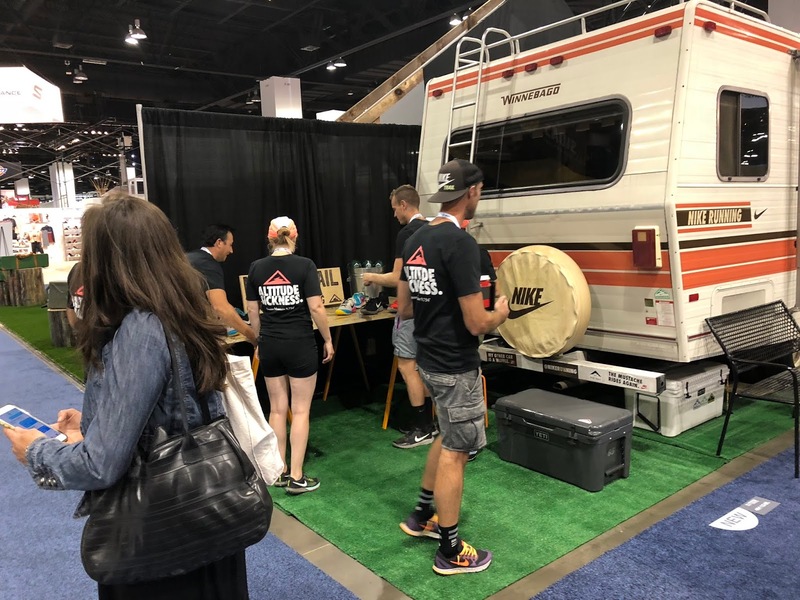 They came complete with their restored 1978 Winnebago and a plywood table to display their two models: Air Zoom Terra Kiger 5 and Air Zoom Wildhorse 5. Offset, 4mm Verifying any changes to stack height. The Kiger 5 is significantly updated underfoot from the Kiger 4 (RTR review). 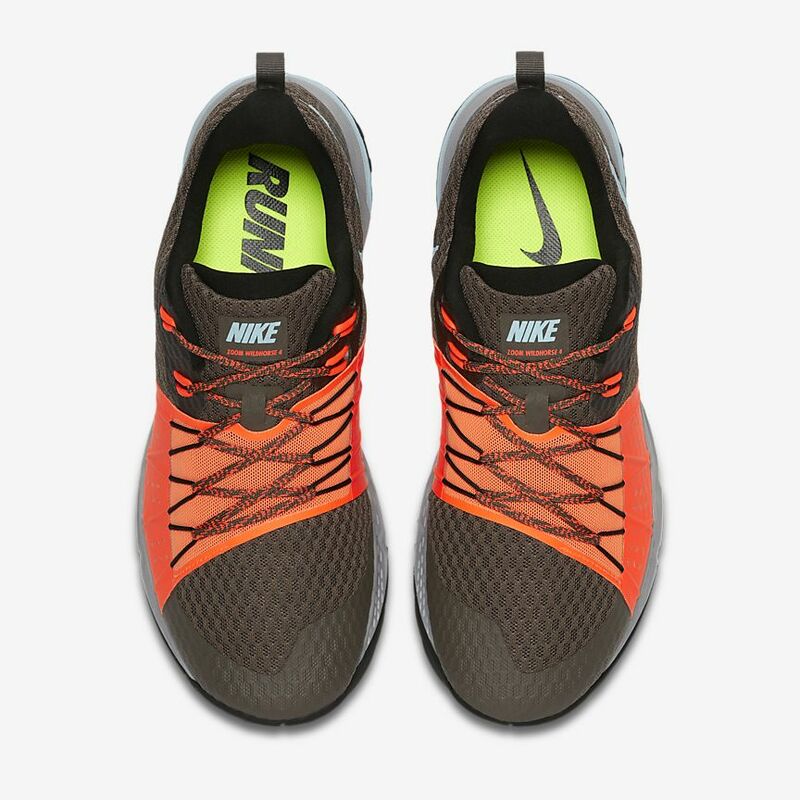 It now features a React midsole with a front segmented rock plate substituting for the prior front Zoom Air unit. 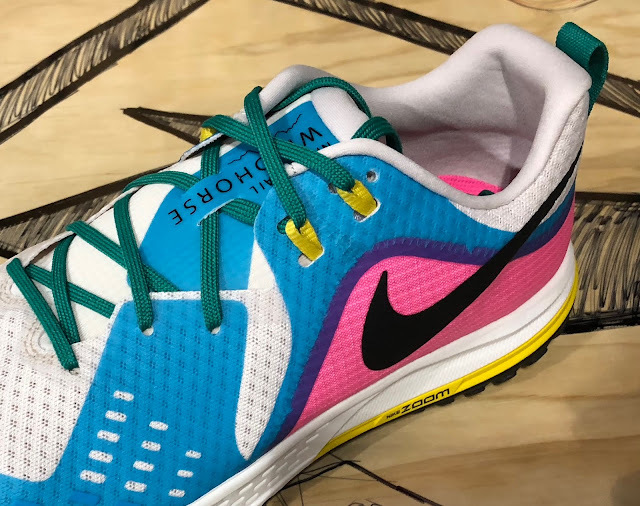 A Zoom Air unit remains in the heel. The seamless warp knit upper remains similar with improvements to the durability of the rear by using a woven heel counter which also reduces weight. 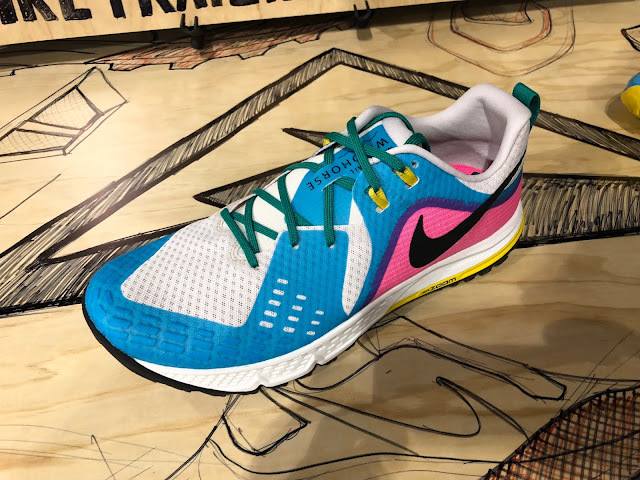 The foot hold via internal straps connecting to the laces and extending to the midsole is carried over. The outsole sees significant changes with more aggressively lugged high abrasion rubber areas front and back focused on dry traction and a mid foot area of sticky rubber for wet and slippery conditions over rocks and roots. This outsole should extend the range of the Kiger beyond its predecessor whose forte was dry smoother terrain. 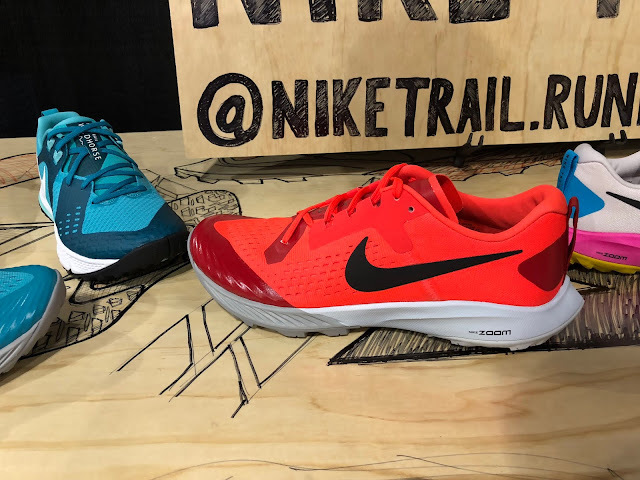 See Nike Trail Running present the Kiger 5 in the RTR YouTube below. 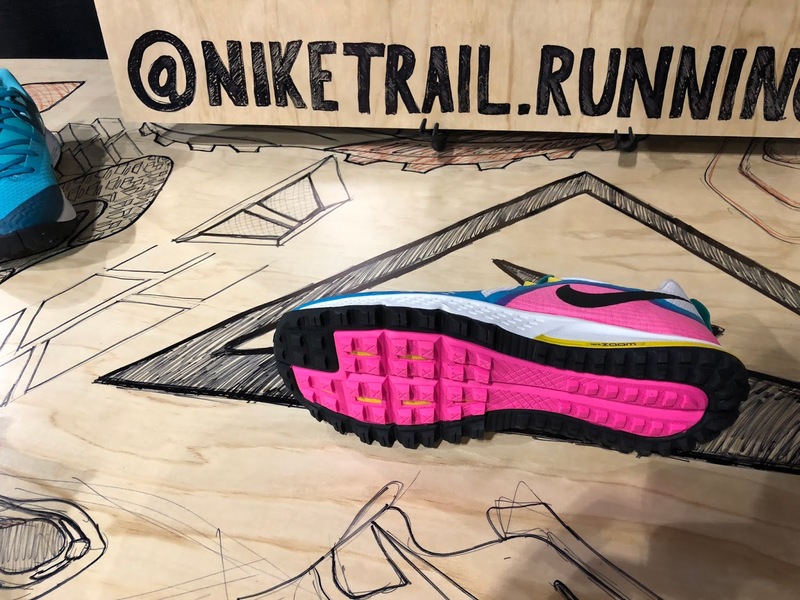 According to what Nike told us the Wildhorse update is to the upper. The mid foot partially external Flywire based asymmetrical mid foot hold of the Wildhorse 4 shown above is swapped for a combination of conventional lacing and internal straps. The outsole is unchanged as far as we know. Not very excited about the Kiger update. 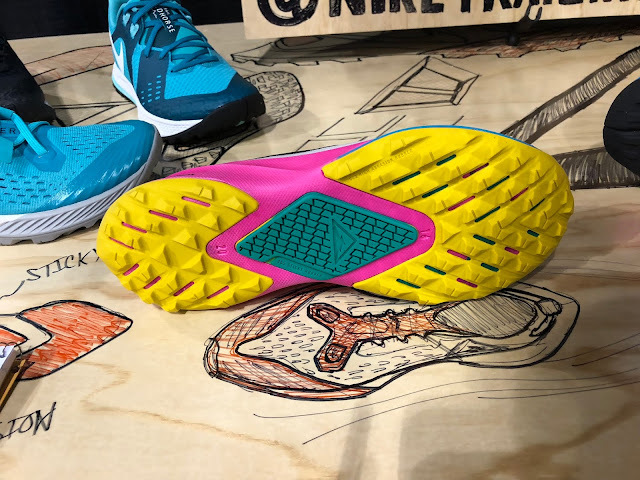 That outsole layout (especially in the midfoot) seems poorly thought out. I could be wrong though. My hope was that they'd start using better rubber in the Nike trail line. The wet traction, particularly on the wild horse is scary bad. Salomon has shown that it's possible to have very durable sole with both wet and dry traction. I agree that traction layout doesn't seem like a good solution when really they just need better rubber all around. I'm skeptical of the new Kiger. I like the forfoot zoom unit, but lighter is always good. 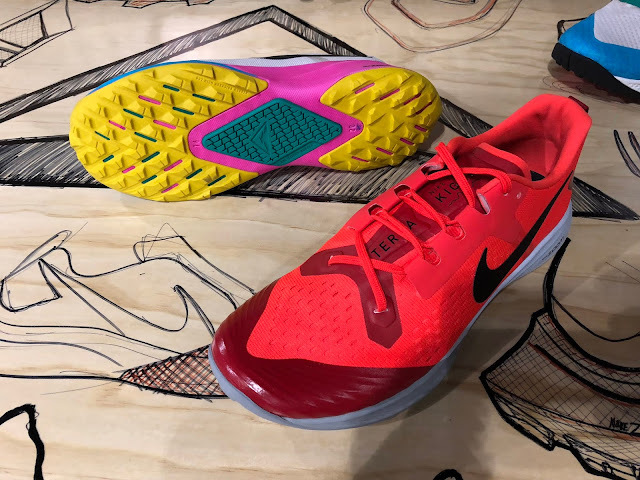 I agree with all the comments thus far, particularly Serge and what he's saying about the choice of rubber compound in the Nike outsoles. 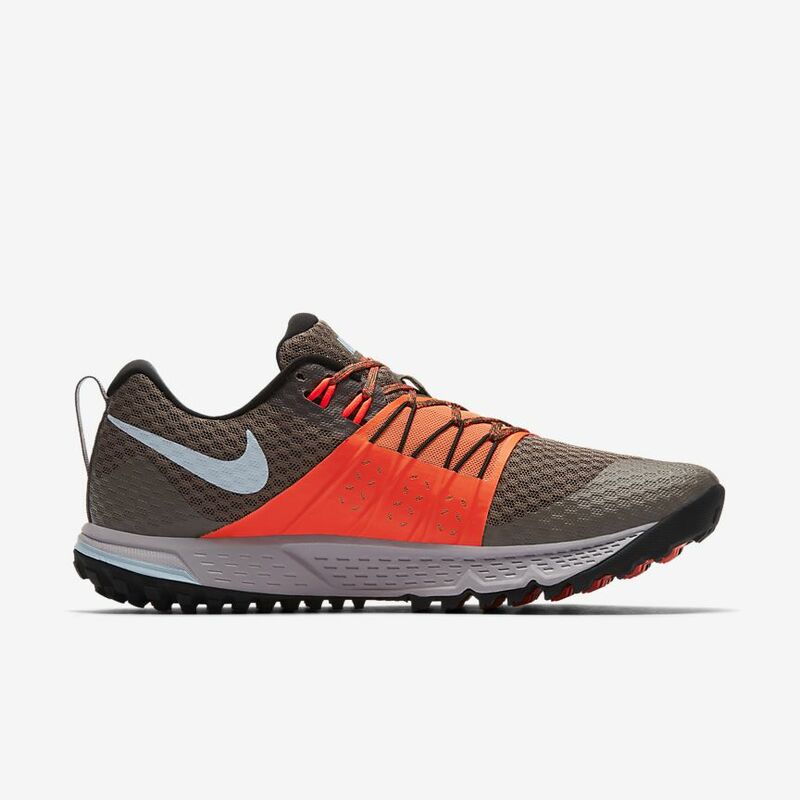 I absolutely love the Kiger 4 (my favourite running shoe in terms of fit) but the grip of the outsole is it's weak point. If the traction was better it could be a year round, all surface shoe. 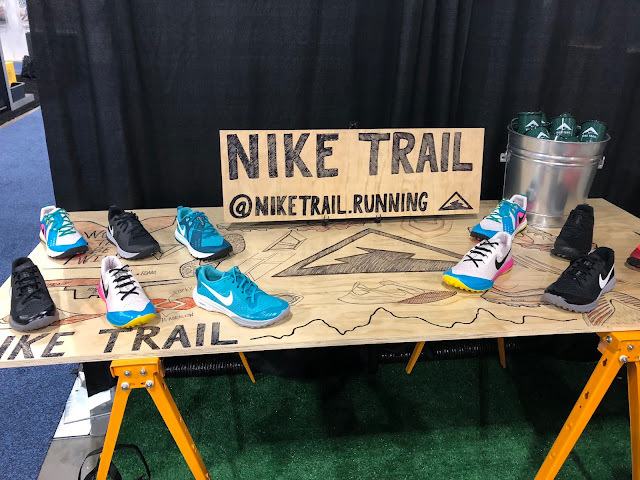 Nike seem to be lacking a clear direction for the Kiger and Wildhorse, or don't seem to care about the changes consumers are asking for. I don't really understand why they have updated the Kiger outsole but not the Wildhorse. Isn't the later supposed to be a more burly shoe for longer outings in the mountains? Where's the aggressive outsole and sticky rubber? Here's hoping both shoes are at least as comfortable as they are currently and they don't end up taking a step backwards with the changes. At least they look good! I excited about the updates on the Kiger, but very confused about the sticky-rubber at the MID foot. I can see how they might function well if your foot is planted flat, but slips also take place on the toe-off which would make this lad ineffective. 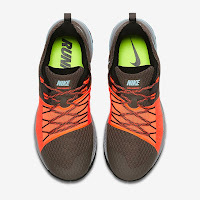 I’m hoping that the new outsole does better than the previous version and doesn’t LOSE traction. I also agree with others that it would be great to see the WH get an upgrade underfoot. I would also love to see a WH with 4mm stack! I was hoping for a better update for the WH4. Good shoe but the outsole is nearly worthless. Lugs wear/rip off in mountain conditions, have zero traction on wet/hard surfaces, and no good in mud. The engineers must spend too much time testing on perfect crushed gravel trails? Are you listening, Nike? For relativity I am a Colorado front range Ultra runner. I have opened 3 pair or the Terra Kiger 4's as well as many other brands of shoes. 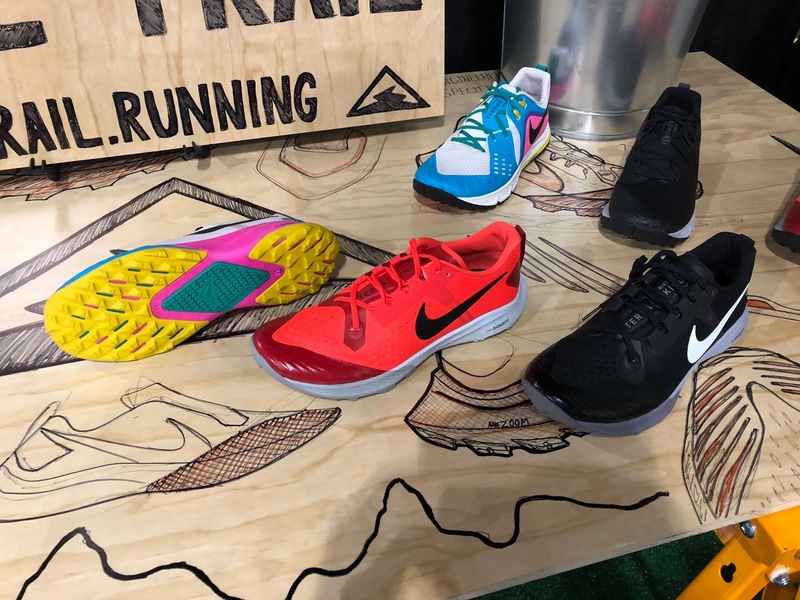 I felt the outsole of the kigef 4 was exceptional and an excellent all around tread. I put in many miles in steep rugged rocky terrain in all seasons. I felt the kigers were incredibly well thought out from durability (I have a pair with 700 miles including Bighorn 100 2018 with miles of crazy mud. No torn lugs still useable and no tears in the uppers. Best trail shoes I have ever owned.